-Hosted an Avalanche Awareness session with Zacs Tracs and also hosted a Avalanche Seminar with Avalanche Canada in November. -Building our Partnership with Industry – Pembina Pipeline Corporation, Midwest Pipelines, Millar Western Forest Products, Blue Ridge Lumber. Pembina built a pipeline through the northern part of our trail system from Gundy Cabin to Carson Cabin and through the areas. Millar Western was busy logging on the north and south areas adjacent and across our trails. Blue Ridge was logging in the north. -Our staging areas are all cleaned up, shed has new siding and tin on the roof. Wood all stocked up for the next season. Upgraded wood stove in Summit cabin. -We sold 163 2017-ASA Membership Trail Passes. We now sell Trail Passes on our website as well as at our suppliers. -Developed a new agreement for renters for the Eagle River Campground. Almost every weekend was booked from May to September. -We’ve approached the Town and County to construct a portion on to the Athabasca Bridge which would assist with snowmobile traffic in the winter crossing the Athabasca River. -Organized a VIP and Media Ride that did not occur due to low snow and warm temperatures. -Organized a Canada 150 Rally for February 18/19 that did not occur due to low snow and warm temperatures. -Partnered with the Golden Triangle Committee on organizing an Adventure 350 Rally planned for March 4/5, but unfortunately did not go forward due to low snow and warm temperatures. -We were given 6 awards from SnoRiders West Magazine for the 18th Annual Rider’s Choice Awards – Platinum – Favorite Snowmobiling Area in Alberta, Silver Favourite Snowmobiling Area in Western Canada, Gold-Favourite Scenic Snowmobiling Area in Alberta, Platinum – Favourite Groomed Trail Riding in Alberta, Platinum-Favourite Powder Riding in Alberta, and Platinum-Favourite area for Family Snowmobiling in Alberta. 1.Dan, Sue, Brad, Rachele and Hailey Guenette – Canadian Council of Snowmobiling Organizations award presented at the ASA Excellence Awards in October. -We won the Provincial SnoRiders West Sledtown Showdown the Provincial level and received a trophy and gift certificate for winning – highest number of voters. Lost out in Round 5. Thank you to our past season Executive for your volunteer time at meetings, club activities and for your time away from your families. 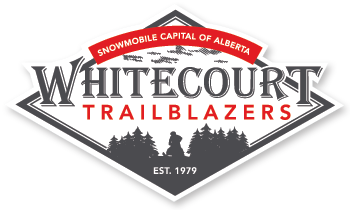 The new 2017/2018 Whitecourt Trailblazers Club Executive members are: President-Dan Guenette, Vice President-Ken Linford, Past President-Aaron Munro, Safety-Rodney Koscielny, Treasurer-Shirley Picard, Memberships-Elaine Gunderson, Industries Liaison-Jeff Brooks, Groomer Operations – Jim Hearn, Facilities-Derek Rooks, N/W Trailboss-Chet Brewster, South Trailboss-Don Price and we have an opening for N/E Trailboss if anybody is interested in helping out. We look forward to a new season in 2017/2018. By the looks of outside, our new board is starting out well with all the snow we received the past few days! !